Part #10768. Manufactured by Magnaflow. 10in Overall, Stainless Steel. Material: Stainless Steel. Our Head Office and Warehouse are located centrally in the West Midlands. 2.5in Inlet / 2.5in Outlet. SKU: 59959. MagnaFlow specializes in superior catalytic converter and exhaust technology and has spent the past 30 years earning its reputation as a global market leader. MagnaFlow Universal Catalytic Converters form the basic building blocks for a comprehensive line of direct-fit applications. Part #59959. Can't find the part you're looking for?. Get in touch. Manufactured by Magnaflow. High Flow Sports Cat. The main benefit of the universal catalytic converter is that one unit may cover a wide variety of vehicle makes and models. Part #59956. Can't find the part you're looking for?. Get in touch. Manufactured by Magnaflow. High Flow Sports Cat. The main benefit of the universal catalytic converter is that one unit may cover a wide variety of vehicle makes and models. Tip Material: Stainless. Tip Shape: Round. Tip Type: Rolled Edge, Double Wall. Tip Finish: Polished. Tip Quantity: 1. Direct Fit Exhaust. Manufactured by Magnaflow Part #10415. Can't find the part you're looking for?. Get in touch. Universal Exhaust Muffler/Silencer. Round 4in x 14in. Body Shape: 4in. Every effort is made to ensure this information is current and up to date. Part No. 59959. Catalytic Converter Body Material Stainless. Catalytic Converter Width 4 IN. 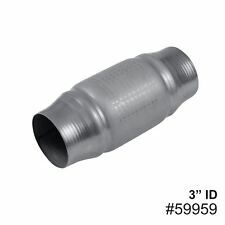 Catalytic Converter Length 3 IN. Stainless MagnaFlow Exhaust Tip. Tip Type: Double Wall, Angle Cut. Tip Material: Stainless. Tip Shape: Round. Tip Finish: Polished. Tip Quantity: 1. Direct Fit Exhaust. Part #59929. Can't find the part you're looking for?. Get in touch. Manufactured by Magnaflow. High Flow Sports Cat. The main benefit of the universal catalytic converter is that one unit may cover a wide variety of vehicle makes and models. MUFFLER BODY MATERIAL 304 Stainless Steel. MATERIAL: 304 Stainless Steel. MUFFLER BODY SHAPE Oval. MUFFLER TYPE Straight Through. This muffler is designed for professional installation. No fitting kit included. Tip Material: Stainless. Tip Shape: Round. Tip Type: Double Wall. Tip Finish: Polished. Tip Quantity: 1. Direct Fit Exhaust. Universal Exhaust Muffler / Silencer. These mufflers are reversible in design and feature a straight through design for maximum flow and minimum restriction. Cherry Red. 3.5" Round x 18" Long. Sound of horsepower from idle to full throttle. Part #10778. Manufactured by Magnaflow. 10in Overall, Stainless Steel. Material: Stainless Steel. Our Head Office and Warehouse are located centrally in the West Midlands. UK Warehouse. Part #59958. Can't find the part you're looking for?. Get in touch. Manufactured by Magnaflow. High Flow Sports Cat. The main benefit of the universal catalytic converter is that one unit may cover a wide variety of vehicle makes and models. Tip Type: Double Wall, Angle Cut. Tip Material: Stainless. Tip Shape: Round. Tip Finish: Polished. Tip Quantity: 1. Direct Fit Exhaust. Rest of the world. Part #59954. Can't find the part you're looking for?. Get in touch. Manufactured by Magnaflow. High Flow Sports Cat. The main benefit of the universal catalytic converter is that one unit may cover a wide variety of vehicle makes and models. Part #10783. Instead of going through the hassle of removing your existing exhaust system, the addition of a MagnaFlow cut-out allows you to easily "uncork" your motor, by giving the exhaust gases a way to bypass the remainder of the exhaust system after the point where the cut-out is installed. Manufactured by Magnaflow Part #10414. Magnaflow Universal Muffler/Silencer 2" ID/OD, Round 4" x 14", Satin S/S | #1041. Can't find the part you're looking for?. Get in touch. Universal Exhaust Muffler/Silencer. Tip Type: Double Wall, Angle Cut. Tip Material: Stainless. Tip Shape: Round. Tip Finish: Polished. Tip Quantity: 1. Direct Fit Exhaust. MATERIAL: 304 Stainless Steel. MUFFLER BODY SHAPE. MUFFLER BODY MATERIAL. MUFFLER TYPE. MUFFLER BODY FINISH This muffler is designed for professional installation. No fitting kit included. Direct Fit Exhaust. Part #10791. Universal Tru Cross-over X-Pipe. Can't find the part you're looking for?. Get in touch. MagnaFlow’s Stainless Steel Tru-X Crossover Pipes have a gentler radius that allows for efficient exhaust gas scavenging, noise cancellation and better balance between cylinder banks. Manufactured by Magnaflow Part #12219. Can't find the part you're looking for?. Get in touch. Oval 5x8in x 14in. Universal Exhaust Muffler/Silencer. 100% Stainless Steel. Material: 100% Stainless Steel - Satin Finish. Manufactured by Magnaflow Part #13146. These mufflers are reversible in design and feature a straight-through design for maximum flow and minimum restriction. Can't find the part you're looking for?. Manufactured by Magnaflow Part #12616. Can't find the part you're looking for?. Get in touch. Universal Exhaust Muffler/Silencer. Round 6in x 14in. Body Shape: 6in. Every effort is made to ensure this information is current and up to date. Manufactured by Magnaflow Part #14419. Can't find the part you're looking for?. Get in touch. Universal Exhaust Muffler/Silencer. Round 4in x 14in. Body Shape: 4in. Every effort is made to ensure this information is current and up to date. Direct Fit Exhaust. MUFFLER BODY SHAPE Round. MATERIAL: Stainless. MUFFLER BODY MATERIAL Stainless. TIP SHAPE: Round. TIP MATERIAL: Stainless. 100% Stainless Steel. SOUND LEVEL Tunable. Manufactured by Magnaflow Part #11256. Can't find the part you're looking for?. Get in touch. Oval 4x9in x 18in. Universal Exhaust Muffler/Silencer. 100% Stainless Steel. Material: 100% Stainless Steel - Satin Finish. Manufactured by Magnaflow Part #10436. Can't find the part you're looking for?. Get in touch. Universal Exhaust Muffler/Silencer. Round 4in x 22in. Body Shape: 4in. Every effort is made to ensure this information is current and up to date. Manufactured by Magnaflow Part #12216. Can't find the part you're looking for?. Get in touch. Oval 5x8in x 14in. Universal Exhaust Muffler/Silencer. 100% Stainless Steel. Material: 100% Stainless Steel - Satin Finish. Manufactured by Magnaflow Part #11113. Can't find the part you're looking for?. Get in touch. Oval 3.5x7in x 14in. Universal Exhaust Muffler/Silencer. 100% Stainless Steel. Material: 100% Stainless Steel - Satin Finish. Manufactured by Magnaflow Part #12259. Can't find the part you're looking for?. Get in touch. Oval 5x8in x 18in. Universal Exhaust Muffler/Silencer. 100% Stainless Steel. Material: 100% Stainless Steel - Satin Finish. Part #10735. Manufactured by Magnaflow. 8in Overall, Stainless Steel. Material: Stainless Steel. Our Head Office and Warehouse are located centrally in the West Midlands. UK Warehouse. Part #10798. Can't find the part you're looking for?. Get in touch. Manufactured by Magnaflow. 10.25in Overall, Stainless Steel. Material: Stainless Steel. Our Head Office and Warehouse are located centrally in the West Midlands. Manufactured by Magnaflow Part #11375. Can't find the part you're looking for?. Get in touch. Oval 4x9in x 11in. Universal Exhaust Muffler/Silencer. 100% Stainless Steel. Material: 100% Stainless Steel - Satin Finish. 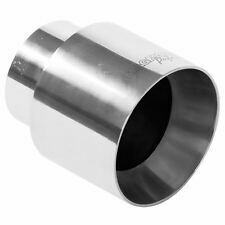 2.5" 6 Round 27” Satin Stainless MagnaFlow Universal Exhaust Silencer 12640. MUFFLER BODY MATERIAL Stainless. MUFFLER BODY SHAPE Round. MUFFLER TYPE Straight-Through. MUFFLER BODY FINISH: Satin. 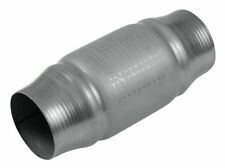 This muffler is designed for professional installation. Manufactured by Magnaflow Part #13145. These mufflers are reversible in design and feature a straight-through design for maximum flow and minimum restriction. Can't find the part you're looking for?. PART NUMBER: 35104. Polished 304 Grade. Exhaust Tip. 3.5" Round / 3" Inlet Tip. 15 Degree Angle Cut. Stainless Steel. Material: 100% Stainless Steel. Every effort is made to ensure this information is current and up to date. TIP TYPE: Resonated, Rolled Edge, Angle Cut. TIP MATERIAL: Stainless. TIP FINISH: Polished. Direct Fit Exhaust. SOUND LEVEL Moderate. TIP SHAPE: Oval. MUFFLER BODY SHAPE Round. MATERIAL: Stainless. Part #10758. Manufactured by Magnaflow. 10in Overall, Stainless Steel. Material: Stainless Steel. Our Head Office and Warehouse are located centrally in the West Midlands. UK Warehouse. Tip Material: Stainless. Tip Shape: Round. Tip Type: Single Wall, DTM. Tip Finish: Polished. Tip Quantity: 1. Direct Fit Exhaust. Manufactured by Magnaflow Part #12198. Can't find the part you're looking for?. Get in touch. Oval 5x8in x 14in. Universal Exhaust Muffler/Silencer. Body Length: 14in. Overall Length: 20in. 100% Stainless Steel.